Clematis 'Arabella' freely produces mid-blue, small upright flowers with striking yellow centres during July and August. 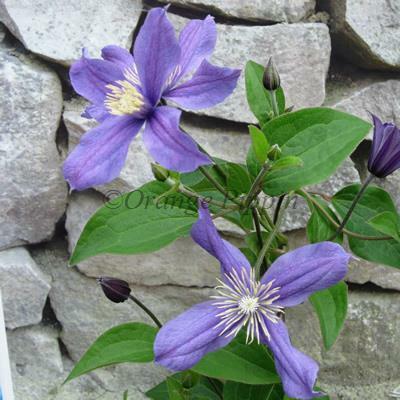 This non-evergreen Clematis is a semi-herbaceous, non climbing variety which can be allowed to grow within the flower border, trained up a trellis, garden fence, pergola, arch, wall or planted in a container supported with bamboo canes or an obelisk on the patio. Clematis 'Arabella' was raised by Barry Fretwell of Peveril Clematis Nursery, England.